WHAT HAPPENED: No. 10 seed Caroline Wozniacki of Denmark is training to run the New York City Marathon later this year, but she had to do plenty of sprinting to try and track down the powerful shots of No. 1 seed Serena Williams in the women’s singles final. 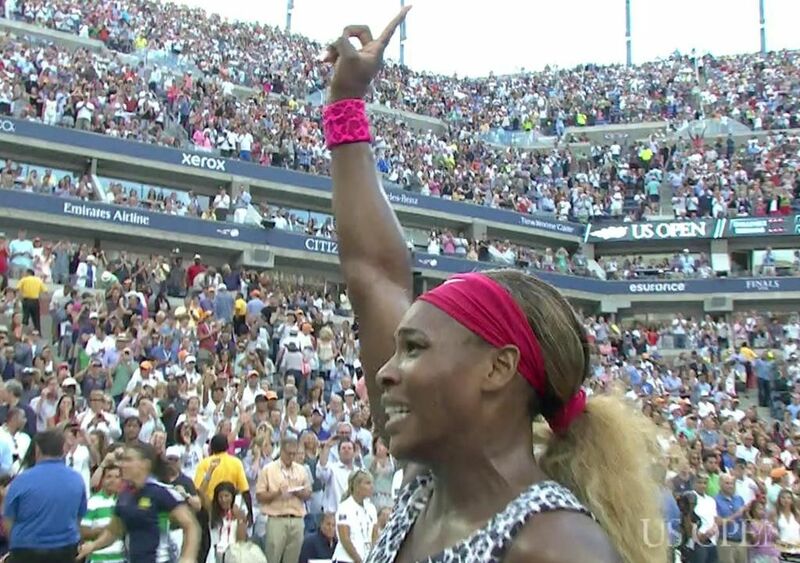 In front of a packed house in Arthur Ashe Stadium, the American showed why she is one of the greatest players of all time. Attacking Wozniacki’s second serves with authority and playing the first-strike tennis she’s known for, Williams put in one of her best performances of the season to defeat her good friend and win the US Open for a third consecutive year, 6-3, 6-3. Williams struck two clean return winners to take a 2-0 lead, but both players struggled with their serve in the early stages of the match. While Wozniacki’s second serve sat up for the No. 1 seed to attack, Williams’ first-serve percentage was below 30 percent at one point, resulting in five straight breaks of serve. Down 2-5 in the second set, Wozniacki fought hard to erase a set point and hold serve. But a backhand winner on set point in the next game wrapped up the opening stanza for Williams. She hit 15 winners in the set compared to just one for Wozniacki. The American continued her one-way dominance by breaking Wozniacki to open up the second set, but the Dane refused to go quietly. She managed to draw errors from Williams by running down shots that would be winners against most and began to up her first-service percentage. Unfortunately for Wozniacki, Williams found the range on her first serve in the second set, upping her first-service percentage from 41 percent to 70 percent, and began to produce routine service holds. With Wozniacki serving to stay in the match at 3-5, a forehand winner from Williams set up championship point. A backhand sent long by Wozniacki after 75 minutes of play brought Williams to the ground and the crowd to its feet as the No. 1 seed won her sixth US Open women’s singles title. Despite the loss, Wozniacki was gracious as always in defeat. WHAT IT MEANS: With this win, Williams captures her sixth US Open women's singles title, which ties Chris Evert for the most Open singles titles in the Open era. The victory also gave the world No. 1 her 18th Grand Slam singles title, trying Evert and Martina Navratilova. Steffi Graf is the only player in the Open era with more Grand Slam titles, at 22. Williams also becomes the first player to win three consecutive US Open titles since Chris Evert, who swept four in a row from 1975 to 1978. This was also the third year that she won the US Open without losing a set, having previously done so in 2002 and 2008. The No. 1 seed collected $3 million for winning the US Open this year, plus an additional $1 million bonus for winning the Emirates Airline US Open Series this summer, making her $4 million check the largest winner's purse in tennis history. Wozniacki received $1,450,000 for reaching the final. Despite the loss, Wozniacki can consider this tournament a bona fide success after reaching her second Grand Slam final and first since the 2009 US Open. She will move back into the Top 10 when the latest rankings are released. THE QUESTION: Do you think Serena can surpass Navratilova and Evert by winning Grand Slam title No. 19 next year?